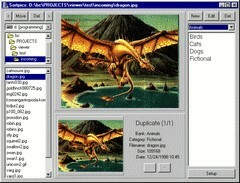 Synopsis: SortPics is an image viewer, image sorter, and duplicate detector. It's designed for people who have a lot of images to go through, and need to categorize them quickly and efficiently. Supports jpg / jpeg, gif, bmp, emf, wmf, and more! The current version is 2.9, released 6/22/2006 ! For a full-size screen shot, click the image above! The ultimate tool for downloading pictures, movies, and archives from web sites. Four times faster than single threaded newsgroup downloaders. The Internet's most reliable newsgroup picture downloader! SBJV is another image viewer application -- it's long standing tried and proven image viewer! Check out the "current projects" page at SB-Software to see all of the latest shareware and freeware programs. Groovy Hex Editor is a simple to use binary file editor for hexadecimal and ascii files. This software features the SB-Software "No Hassle Guarantee". This software contains NO spyware, NO adware, NO viruses, NO trojans, has NO disabled features, and does NOT expire. Sortpics is compatible with ALL recent versions of Windows, including 95, 98, ME, NT, 2000, and XP! A lot of work has gone into the graphical user interface that is implemented in SortPics to ensure that you are able to categorize the pictures that you have downloaded quickly and efficiently. The main window allows you to not only see the current image that you are working on, but also any duplicate images. The right hand panel includes a bunch of quick-category buttons that you can click to move an image in one simple step -- or you can assign hot keys if you prefer using the keyboard. The SB-Software Package Deal -- Check it out! SBNews/NewsRobot: Automatically download and decode images from binary newsgroups. Fast, easy to use, and many special spam-fighting features! Quadsucker/Web: Fast multithreaded web spider and download software. Downloads entire websites with ease! The full product list of SB-Software includes many more programs including image viewers, sorting utilities, screensavers, editors, newsgroup and website downloaders, and games.